For the last couple of months I have been studying and preaching through the 2nd half of 1 Samuel. 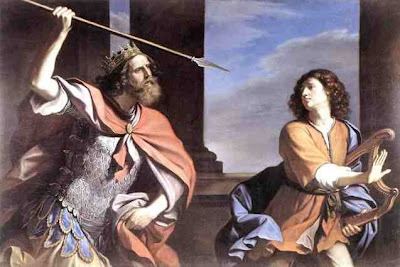 The narrative presents a compelling contrast between David, the anointed future king of Israel, and Saul, the de facto king whose disobedience to God has led to the loss of his kingdom. Few places in Scripture give us more insight into the insidious nature of evil than the sad descent of Saul into spiritual self-destruction. From fear to disobedience to envy to paranoia to hatred to full-scale savagery and murder -- Saul is a case-study of a seemingly good man who goes bad. This afternoon I was skimming part of Rebecca Manley Pippert's book A Heart for God: Learning from David Through the Tough Choices of Life , and read this wise passage on how people full of hatred justify themselves by playing the victim. "Hatred is aggressive, but it often plays the victim. Saul insisted that he was being persecuted, attacked, and victimized. What an inversion of truth! He was the abuser, the persecutor who relentlessly pursued David. Saul claimed David was maligning him, when it was Saul who slandered David. Saul acted as if he were the only one in anguish, yet there was not an ounce of concern for all the pain he had inflicted upon David, not to mention on his own son Jonathan and his daughter Michal. His total self-centeredness was exceeded only by his paranoid deception. Why is playing the victim so important for maintaining our hate? Because it lets us off the hook. It's another way of insisting on our innocence. It enables us to indulge self-pity, which further justifies our hate. Saul reasoned like this: 'I really don't like doing this to David. I feel badly about being so angry. But I was just innocently being a king, and the next thing I knew, David tried to take my kingdom away from me! I am only protecting my rights.' The text of 1 Samuel shows that this was self-justification at its worst. Hatred is by nature an aggressive force, but it likes to appear weak and dependent." Saul's descent into evil exemplifies the corrosive power of internalized fear, self-pity, and resentment and the subtle ways we mask the moral decay in our hearts with excuses, finger-pointing, blame-shifting, and playing the victim card. How do you know that this is happening to you? Saul's story gives us a clue. In 1 Samuel 19, Saul's son Jonathan tries to dissuade Saul from pursuing David's death. Saul listens -- for a short while. But he doesn't let go of his hatred and in his paranoia, he eventually turns on Jonathan, too. He had already rejected the counsel of Samuel. Now he turns on Jonathan. And in just a couple of chapters, Saul accuses his army of conspiring against him and then authorizes the brutal murder of an entire village. This shows us the pattern of evil and self-deception. It often masquerades as victimization and always leads to increasing isolation. The self-deceived person refuses to listen to others. He insists on his own version of the story and woe to any person, even former friends and counselors, who see it another way. Sooner or later, the person in the grip of hatred turns on the very people he once trusted and loved the most. And he feels justified to the end, because after all, he was the victim. So here is one way to gauge how strong a grip sin has on your own heart: how do you respond when other people confront you? Do you let them in? Are you willing to take a close look at this other version of yourself that you are blind to, but that others see? Or do you play the victim card and then shut down conversations with anyone who dares to disagree? If you are convinced that your family and (former) friends are wrong and you are right, maybe it's time to take a look in the mirror.